Compton, California (August 1, 2016) – 4 Wheel Parts, the global leader in off-road performance product sales and service, has announced its entrance into the immensely popular and growing UTV aftermarket. In launching its foray into the emerging UTV marketplace, 4 Wheel Parts has formed a multi-tiered alliance with the influential digital portal, UTVUnderground that will include content creation, marketing collaboration and the launch of the “UTVUnderground Garage” which will provide a vital retail resource to the UTV enthusiast. With the widening popularity of UTVs as a performance platform, UTVUnderground and its online destination UTVUnderground.com has emerged as the preeminent authority in the category. Along with many first to market product reviews and significant manufacturer engagement, UTVUnderground has established itself as the leading influencer in the continually expanding UTV marketplace. “There are millions of UTV enthusiasts looking for information and products every day and we are inundated with inquiries from people looking to purchase the products we feature on UTVUnderground.com,” said Joey DiGiovanni, founder and CEO of UTVUnderground. 4 Wheel Parts sales and distribution of UTV performance parts and accessories will provide consumers the opportunity to shop by phone, in-store and online with the same convenience and dependability truck and Jeep owners have come to rely on for decades. Retail sales and installations of UTV products will be first introduced to select Southern California, Nevada and Arizona 4 Wheel Parts locations as all 75 stores nationwide will subsequently be retrofitted with UTV focused displays and in-store inventory. “In addition to numerous customers inquiring about UTV products, many of our suppliers are adding UTV parts and accessories to their existing lineups. Having over 55 years of experience servicing the off-road enthusiast, it is a natural fit for 4 Wheel Parts to expand into this category,” added Botello. “This partnership with 4 Wheel Parts allows us to complete the circle and sell directly to customers with a combination of 4 Wheel Parts brick and mortar retail infrastructure and a significant online presence. Our goal will be to create an exceptional retail experience. After all, we are selling this exciting lifestyle,” said DiGiovanni. Spearheaded by motorsports content powerhouse Mad Media, the creators of the Polaris XP1K viral video series franchise that has collected over 24 million views, UTVUnderground and 4 Wheel Parts will be collaborating on an aggressive marketing program designed to introduce UTV enthusiasts to 4 Wheel Parts and UTVUnderground Garage through unique, compelling content. “We have a proven history of creating some of the most engaging content in the off-road and UTV industry,” said Mad Media CEO, Matt Martelli. “We will be launching an aggressive content plan that includes a television package, online video and photography as well as editorial content. It’s a new way to entertain, inform and sell to UTV enthusiasts along with mainstream consumers. We are just barely scratching the surface in the UTV aftermarket. This partnership with 4 Wheel Parts will radically evolve mainstream UTV retail targeting,” concluded Martelli. UTV enthusiasts will have their first opportunity to see elements of this partnership at the official unveiling of the 4 Wheel Parts/UTVUnderground Garage on Friday, September 16th at the Sand Sports Expo in Costa Mesa, Ca. Visitors to the massive 4 Wheel Parts/UTVUnderground Garage display at the show will have an opportunity to check out several insane UTV builds, purchase accessories from some of the best brands in the industry and enter to win a brand new 2016 Polaris RZR 1000. The world’s fastest growing all-inclusive UTV site contributed to by both enthusiasts and manufacturers alike. UTVUnderground is the go-to site for fresh, original content and is known for its dedication to hosting all of the latest news and insight surrounding the UTV culture. Thousands of monthly visitors from over 100 different countries around the world go to UTVUnderground.com for their daily dose of UTV news and information. Mad Media (www.madmedia.com) is a San Diego based marketing and creative agency, with in-house film and television production. We craft authentic, culturally engaging brand messages, and deliver them across print, web, photography, and film platforms. Mad Media has been leading the online content revolution since 1995 producing major commercial, television, online content and viral film projects such as The Gymkhana Series and XP1K Series. Owner of The Mint 400 off-road race and UTV World Championship off-road race, Mad Media has pioneered marketing campaigns integrating events with print, online, social media, TV content and merchandise to create fully integrated brand experiences. 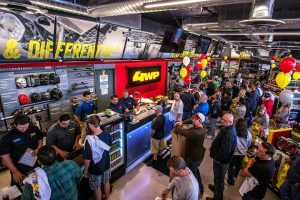 Compton, California (July 15, 2016) – This Saturday, July 16, 4 Wheel Parts will hold the grand opening celebration for its newest retail store in Richmond, Virginia. 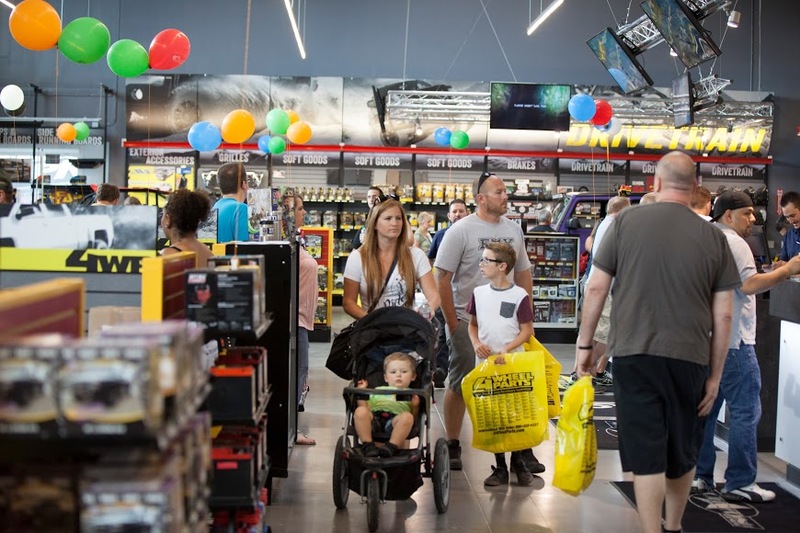 The official opening of this 75th retail location represents a new milestone for the global leader in off-road performance product sales and installation. With the company in the midst of an aggressive North American expansion, the event comes on the heels of recent grand openings in Jacksonville, Florida and Langley, BC, Canada. Led by Brandon Holmberg, who has been tapped to manage the new location, 4 Wheel Parts Richmond will be opening its doors to customers on Saturday morning to an immaculate, state-of-the-art showroom featuring installation facilities outfitted with cutting-edge equipment and the industry’s most advanced diagnostic tools. Saturday, guests will be treated to a family-friendly, atmosphere with the special opportunity to discover products from many leading manufacturers while participating in activities that include live remote radio broadcasts, hourly giveaways, vendor and vehicle displays along with complimentary Southern BBQ. “We’re thrilled to be joined by our friends from the RVA Rock Crawlers along with the Virginia 4 Wheel Drive Association as we showcase our new store,” added Holmberg. 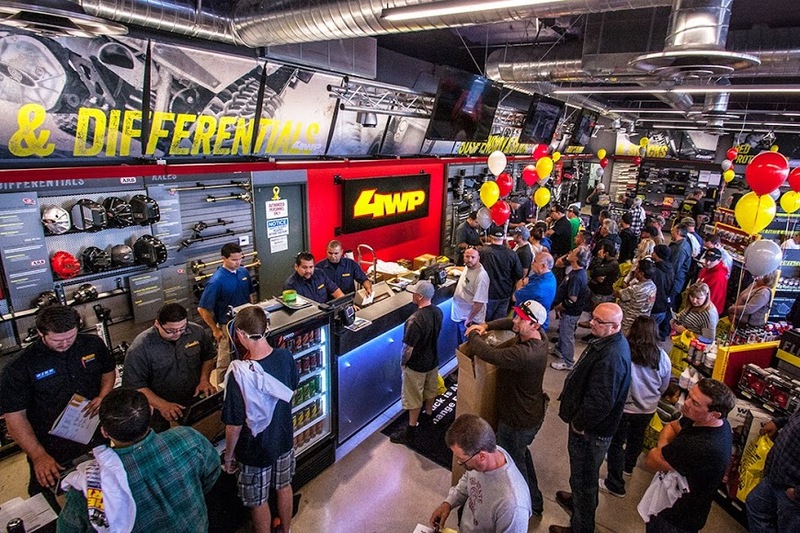 The free gathering will offer discounted grand opening specials on a spectrum of products while onsite, ASE-certified technicians will provide installation discounts on select parts. When: Saturday, July 16 from 9 a.m. – 5 p.m.
4 Wheel Parts is the global leader in truck, Jeep, SUV and off-road performance products. With 75 locations across the U.S. and Canada and growing, 4 Wheel Parts Service Centers install all the products they sell. Maintaining the nation’s largest inventory of off-road tires, wheels, lift kits, and accessories, 4 Wheel Parts serves customers across the country and around the globe. Life is Better Off-Road™. Visit them at 4wheelparts.com or call toll-free 877-474-4821. Compton, California (June 10, 2016) – This weekend, Ultra4 Racing and Team 4 Wheel Parts will be storming the hillsides of Southern California’s Glen Helen Raceway with the 6th edition of the 4 Wheel Parts Glen Helen Grand Prix. 4 Wheel Parts President and CEO, Greg Adler along with brother, Kevin will be among the more than 100 Ultra4 vehicles slated to take on this second event in the 2016 Ultra4 Trail-Gear Western Regional Series June 10-11. Legendary Glen Helen Raceway has hosted a significant number of prolific two and four-wheel off-road events, but none more grueling than the hybridization of rock crawling with short course and desert racing, with competitors racing against the clock in a Grand Prix format with a $10,000 purse on the line. The closed course event conducted across the venue’s sprawling hillside landscape will provide spectators the opportunity to enjoy the event from multiple vantage points, providing them an up close and personal perspective of the same vehicles that compete annually in the King of the Hammers race. Greg Adler, a veteran of Ultra4 competition, will be campaigning a vehicle owned by Brent Goegebuer, who has been sidelined due to a violent crash at the 2016 King of the Hammers. As the series’ final visit to Southern California for the year, the 4 Wheel Parts Grand Prix represents a cherished opportunity for competitors to earn a coveted invitation to the marquee King of the Hammers event as well as tally valuable points toward the Nitto National Championship. For Greg Adler, his presence in the race also serves to further represent 4 Wheel Parts as the industry leader in the truck, Jeep and SUV performance aftermarket. Kevin Adler will be pitted alongside his brother as he campaigns his Smittybilt Every Man Challenge #4602 Jeep in the Pro Comp stock class. While his limited class vehicle based on a factory Jeep JK doesn’t boast the horsepower or suspension travel of the Ultra4 cars, he will be taking on the very same course as his unlimited class brethren. The event’s two day format features Friday afternoon qualifying sessions to determine Saturday’s preliminary starting position with racing kicking off at noon on Saturday. Ultra4 weekend passes are available for $20. The Glen Helen facility offers no-charge dry camping for spectators with the purchase of a weekend pass. 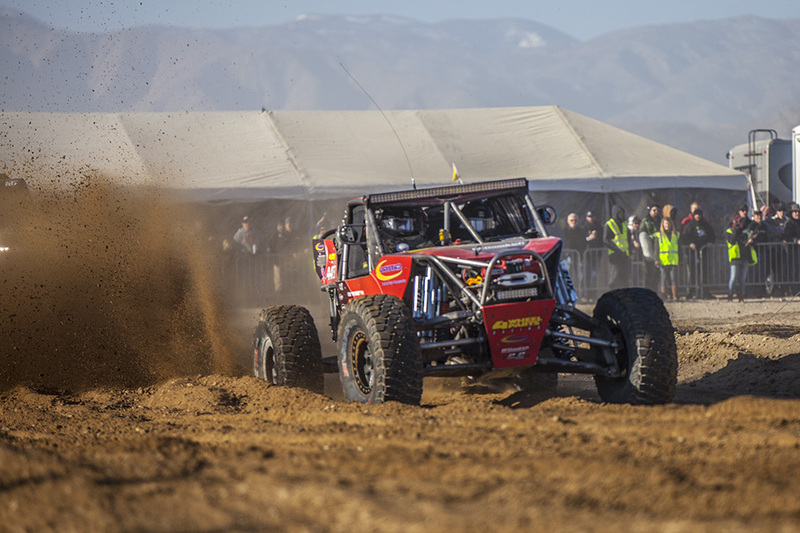 Saturday’s action packed day of racing features UTV, Legends, Stock and Modified 4-wheel drive vehicles in addition to the marquee Ultra4 division. Please visit Ultra4racing.com for a complete listing of the weekend’s events, driver rosters and additional information about Ultra4 racing and the 4 Wheel Parts Glen Helen Grand Prix. 4 Wheel Parts, the global leader in off-road performance product sales and installation, has signed an agreement to be an Official Partner for the 2016 SCORE World Desert Championship. The agreement allows 4 Wheel Parts retail operations and their associated product divisions and social media platforms to be part of shared SCORE race and custom content video programs for viewing in retail show rooms. Per the agreement, SCORE International race promotions as well as continuing SCORE SEMA Baja 1000 Qualifier ticket allocation promotions will be available exclusively at the Las Vegas 4 Wheel Parts location. 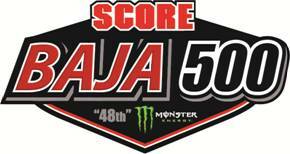 The announcement comes just prior to the 48th anniversary of the SCORE Baja 500 held June 1-5. Over 250 entries are expected at the start line for the 477.52-mile loop race course that starts and finishes in Ensenada, Mexico. The green flag on Saturday (June 4) will drop first for the motorcycles and quads at 5:30 a.m. and at approximately 10 a.m. for the cars, trucks and UTVs. There is a 21-hour time limit in the elapsed-time race to become an official finisher. 4 Wheel Parts is the global leader in off-road truck, Jeep and aftermarket performance products. With 75 locations across the U.S. and Canada and growing, 4 Wheel Parts Service Centers install all the products they sell. Maintaining the nation’s largest inventory of off-road tires, wheels, lift kits and Jeep accessories, 4 Wheel Parts serves customers across the country and around the globe. Life is Better Off-Road™. Visit them at 4wheelparts.com or call toll-free 877-474-4821. Compton, California (April 6, 2016) – Friday, April 8, the first ever COMMANDO TACTICAL EDITION™ Jeep Wrangler built by Transamerican Auto Parts (TAP) off-road performance retailer 4 Wheel Parts, will be auctioned at the Barrett-Jackson Palm Beach Collector’s Car Auction. One hundred percent of the proceeds from the sale of this unique, street legal vehicle will benefit the Patriot Foundation, providing support to the families of airborne and special operations soldiers killed or wounded in combat. 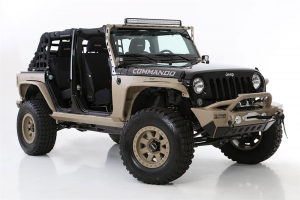 Similar to the military version, COMMANDO TACTICAL EDITION™ Jeep is a go anywhere, do anything military-inspired steel flat fender design built on a 2015 Jeep Wrangler Unlimited Rubicon platform and one of the most capable, rugged and versatile vehicles ever created. Its extensive TMG supplied enhancements include suspension upgrades, Pro Comp performance wheel and tire combination, lighting package, Smittybilt Armor and Soft Goods Package, 9.5K wide-capacity Smittybilt winch and many other distinctive features exclusively available as a complete program through participating DSI dealerships. Donated by Hendrick Dynamics and Transamerican Auto Parts, this Jeep also features a custom patriotic hood graphic painted by Zac Brown Customs’ Kristian Baena, Specialty Equipment Market Association (SEMA) 2013 Rising Star Award Winner. Inspired by the original Hendrick COMMANDO™ tactical vehicle, the COMMANDO TACTICAL EDITION™ Jeep is a collaboration between Transamerican Auto Parts subsidiaries Dealer Services International (DSI), 4 Wheel Parts and Transamerican Manufacturing Group (TMG) and Hendrick Dynamics. 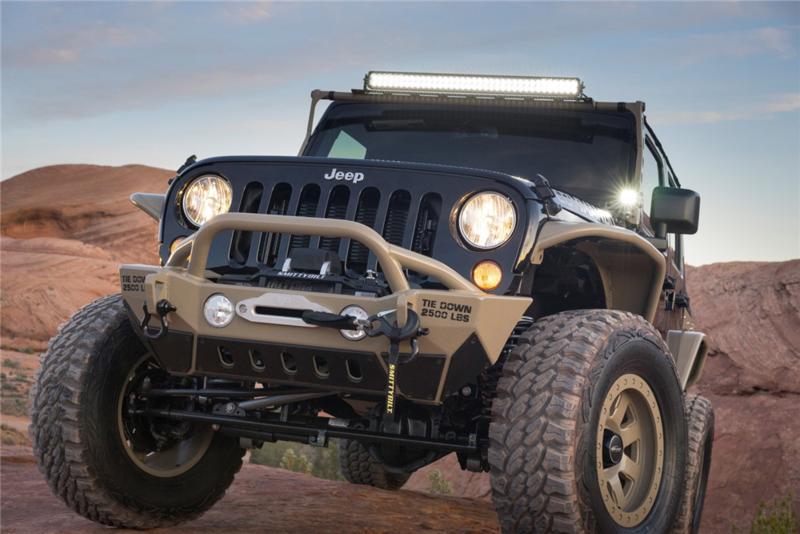 Together they premiered this spectacular vehicle at the 2015 Easter Jeep Safari in Moab, Utah featuring aggressive design, style and versatile up-fit technology; including an exact replication of the authentic COMMANDO™ Tan™ exterior color. The original Hendrick COMMANDO™ is a tactical vehicle that provides the military with a versatile mobility platform capable of operating across a wide range of missions and terrains, and was initially fielded overseas for evaluation purposes in support of a special operations science and technology initiative. Historically, the Hendrick COMMANDO™ was the first Jeep utilized in U.S. combat operations since Operation Just Cause in 1989. Inspired by the Hendrick COMMANDO™ military vehicle, the first Jeep utilized in U.S. combat operations in over 25 years, this COMMANDO TACTICAL EDITION™ Jeep is one of the most capable, rugged and versatile vehicles ever created. One Hundred Percent of Proceeds benefiting the Patriot Foundation. 4 Wheel Parts is the global leader in truck, Jeep, SUV and off-road performance products. With 74 locations across the U.S. and Canada and growing, 4 Wheel Parts Service Centers install all the products they sell. Maintaining the nation’s largest inventory of off-road tires, wheels, lift kits, and accessories, 4 Wheel Parts serves customers across the country and around the globe. Life is Better Off-Road™. Visit them at 4wheelparts.com or call toll-free 877-474-4821. Dealer Services International is a business unit of Transamerican Auto Parts, and is the nation’s largest up-fitter of Custom Trucks and Jeeps in North America. Exclusively serving new vehicle dealerships DSI conducts business in both the US and Canada, with over 2,000 dealer partners. Our Design, engineer, and build capabilities have enabled us to provide OE quality and tested custom vehicles that are unmatched in the industry. In addition, our industry leading service and warranty programs enable the consumer to experience the same level of ownership they expect from a new vehicle. To learn more about DSI please visit www.dsicustomvehicles.com. Transamerican Auto Parts is the world’s leading manufacturer, wholesaler and retailer of aftermarket parts and accessories for trucks, Jeeps, SUVs and four-wheel drive vehicles. Transamerican operations are comprised of 74 4 Wheel Parts retail locations in North America, Transamerican Wholesale sales and distribution, Dealer Services International and the Transamerican Manufacturing Group which includes Smittybilt, Rubicon Express, G2 Axle & Gear, Pro Comp, LRG Rims and Poison Spyder. We Sell It. We Own It. We Live It. For more information about Transamerican Auto Parts, Dealer Services International and Transamerican Manufacturing Group, please visit: transamericanautoparts.com.